Every baptized person is called to ministry. The Education for Ministry (EfM) program provides people with the education to help discern and carry out that ministry. During the Service of Confirmation, we ask God to "Renew in these your servants the covenant you made with them at Baptism. Send them forth in the power of the Spirit to perform the service you set before them." EfM offers an opportunity to discover how to respond to the call to Christian service. EfM is a four-year certificate program in theological education based on small-group study and practice. However, participants register for one year at a time. The program is through the University of the South, Sewanee, TN. Seminar groups consist of six to twelve participants and a mentor. Mentors have been specially trained and renew their certification every 18 months. Meetings are weekly over a nine-month year. Studies include: Old Testament, New Testament, Church History, and Theological Choices (a study of theological trends and movements in the Church). Additionally, the seminar is supported by a life of prayer and regular worship. EfM groups are encouraged to develop a pattern of worship appropriate to their situations. Liturgical materials are furnished with the course materials. It is through study, prayer, and reflection that individuals grow to a new understanding of the varied and wide vision of God’s kingdom. Through discussion and guided reflection, the seminars furnish an opportunity to deepen understanding of the reading materials. The skill of theological reflection provides an opportunity to examine your own beliefs and learn what it means to be effective ministers in the world. If you are interested in learning more about Education for Ministry, please contact Sabrina Evans at sevans@epiok, and she will connect you up to a local group. 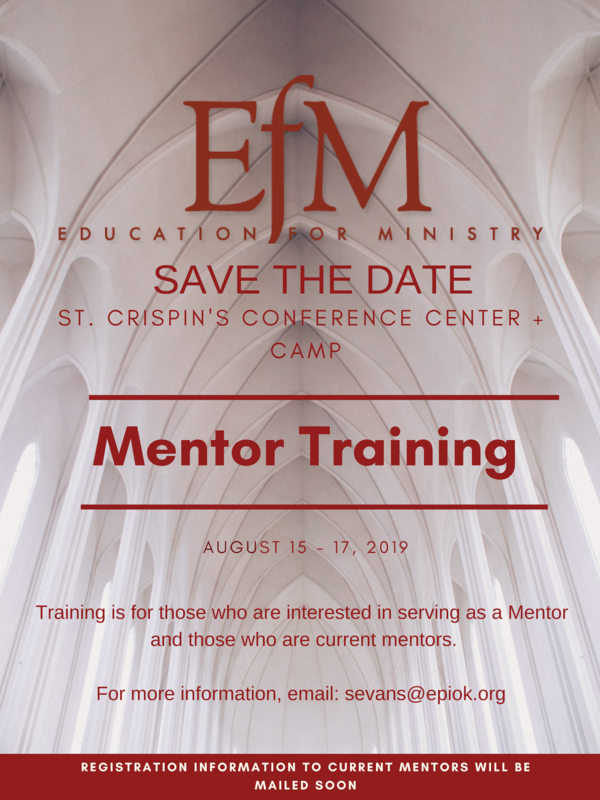 If you have previously taken EfM and are interested in starting a group in your church area, a Mentor Training will be offered August 15 - 17, 2019 at St. Crispin’s. Registration information will be available soon.